We are a group of registered health practitioners in Campbell River dedicated to helping their clients overcome physical limitations and improve their health and well being. We do our utmost to create a warm, comfortable and relaxing atmosphere for our clients. 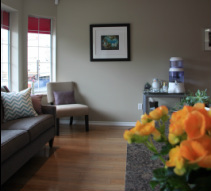 Our clinic is conveniently located in downtown Campbell River on 12th avenue with ample parking at Eagle Ridge Plaza. Our practitioners are a group of like-minded, personable professionals and include a Doctor of Traditional Chinese Medicine/Registered Acupuncturist, Registered Dietitian, Chiropractic Doctor and five Registered Massage Therapists. All of our therapists regularly upgrade their skills through continuing education courses. The group at Thrive believes that collaboration is essential to any therapy and each works with their patients to establish and meet individual, noticeable goals. Open five to six days a week and offering evening appointments, Thrive Therapeutics welcomes all ages and demographics in Campbell River and the surrounding area. Our patients' comfort is always of the utmost importance; feel free to contact us as we will be happy to help answer any questions or concerns you may have.